An excellent chase day for such a marginal setup and a good way to start the tour! We left Oklahoma City bright and early with the idea of chasing storms somewhere between Limon and Fort Morgan, Colorado, so we knew we had a long drive in front of us. The group was ready to roll at 7:30 and we made good time, getting into Colorado by about 3:30 Mountain Time. What we saw when we got there was not good however! A cirrus deck near the Colorado / Kansas border had slowed heating all day and was still there as we got into Colorado. On satellite, it was clear elevated cumulus were forming to the west once it cleared, but the question was whether storms would fire on the excellent convergence projected by the models on the east side of the Denver Convergence Vorticity Zone (DCVC). We were discussing dropping the bags off in Limon and waiting when the first storm blew up near Byers and quickly went severe. We got to Limon and blasted north towards Last Chance and the storm was suddenly tornado warned! 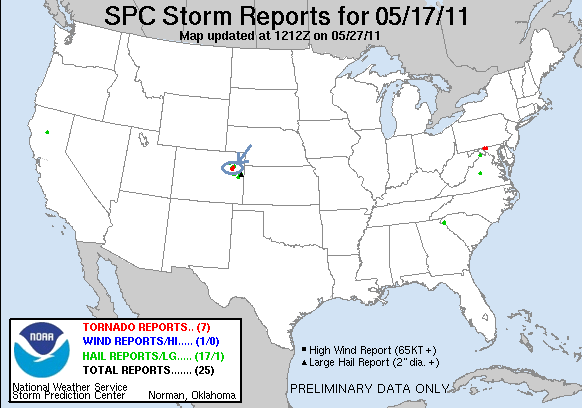 While mesocyclone tornadoes weren’t likely because of the extremely high cloud base, landspouts were definitely in play. We continued to charge north, but soon it was clear we would not be able to get through the core to where we had to be, so it was off onto the mud roads between Woodrow and Akron. Despite getting rained and hailed on pretty hard, the roads were in great shape and after stopping and observing for a bit, we hit the pavement south of Akron, but instead of heading north decided to head south as a new cell down there had been tornado warned with one reported tornado. As we charged south around the back side of the line, we plowed directly into the hook echo of the rotation of the tornado warned cell and were hammered by strong winds and rock-hard quarter sized hail. As we got through there was violent rotation to our east, but it was very high based and didn’t produce. After a while longer observing several attempts of the storm to get its act together, we headed south to try and intercept a new severe cell which was right along I-70. We picked up the storm near Siebert and went blasting through the hail core on I-70 near Vona. As we neared the core, the sun was setting, so the storm was pitch black, but the hail was reflecting white in the Sun so you could clearly see the sheets of hail coming towards us, then it was like someone dropped a giant bucket of ping-pong balls in front of us! It was an awesome core punch and we got through unscathed. We stopped in Stratton to refuel and as the storm caught us we headed to Bethune and stopped and filmed the now highly electrified storm. After we’d had enough of that, we plowed through the hail core again and off to the hotel in Limon. There was enough hail that the plows were out on the highway and the fields were covered in white. What a fun day to start the tour when the setup looked bad, and when we reached the target area it got worse! The target area verified almost exactly. It was a long day of driving, 828 miles, but worth it. Approaching our first storm of the year near Last Chance, CO. We head off east into the dirt roads to get away from a big hail core. A big, flat updraft base is just to our west. Lowering off to our north. We headed for a new storm to our south, driving right under a rapidly rotating mesocyclone. Here we stopped to check it out as it moved off to the east, with hail falling around us. Funnel! The base drifts off to the north, dumping out a big hail core to it's north. Another look at the cell drifts off. And yet another hail core to our east. Hail was the name of the game on this day! We headed back south to the interstate, then tried to cut between two big cells that were both dumping hail. A big curtain of hail closing on the highway to our east told us we weren't going to make it! As we hit the hail core it was like someone dropped a bucket of ping pong balls on us! The hail was illuminated in white by the setting Sun against the black storm clouds. We stopped in Seibert to fuel up and watch as the now highly electrified hail storm caught back up to us.